The PPC Cement Bag’s beginning was similar to this. The design was more a result of playing with materials and allowing myself to be open to new experiences than an idea alone… I had been experimenting with fabric fusing and wondered if it would bond to paper. Some time later I was driving behind a PPC Cement truck laden with packaging, saw the elephant branding and thought it was pretty cool. What happened next was the creation – the PPC Cement Laptop Bag. This entry was posted in Blog and tagged beginning, beginning of idea, connecting, creeativity, fabric fusing, how to be creative, ppc cement bag story. very relevant insight, and true! It’s nice to hear about the ‘birth’ of your bags Wendren. I bet you were excited when you saw those elephants on the bags! I know I would have been. I was in an aeroplane going to Norway and I saw the cutest horse logo stitched onto the seat head covers. Very tempting! and I had many ideas going thru my head. Congratulations on being stocked in LIM! and I like the quote below too, is not all life uncertain, even with plans? Plans are merely well intentioned hope. 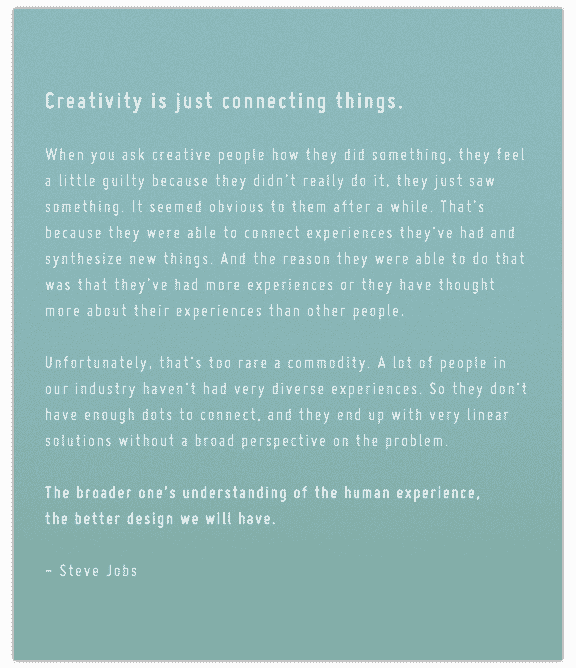 I agree with Annette´s comment.Very true by Steve Jobs. Love the quote! Thanks for sharing it!